"An authentic analogue vocoder simulation and beyond"
Back once again with the XILS behaviour. 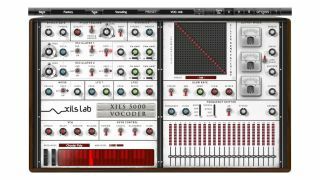 XILS-Lab has taken the wraps off its latest emulation - a plugin version of a classic analogue vocoder that goes by the name of XILS Vocoder 5000. Given its interface design and the fact that XILS-Lab has emulated various EMS products in the past, we're assuming that what we're looking at is a software version of said company's Vocoder 5000. It's said to offer an organic and realistic sound, a frequency bands pin matrix, hundreds of MIDI-automatable parameters and more. Pricing is still to be confirmed, but we do know what XILS Vocoder 5000 is scheduled for release on 17 December via the XILS-Lab website.